Confused About How to Tie PR Outputs to Organizational Outcomes? Consider the AMEC Framework! Jeffrey’s explains how PR pros can use the AMEC Valid Metrics Guidelines to tie measuring outputs (such as clip counts or impressions) to business or organizational outcomes (such as leads, sales, donations, and/or survey scores). Over the past decade, I’ve had the chance to consult with organizations of all sizes regarding their need to measure, and learn from, their public relations campaigns. Fortunately, they’ve all heard PR industry teachings about the importance of accountability, which has made my job easier! But, most are confused as to how to move beyond simply measuring outputs(such as clip counts or impressions) to more meaningfully tying together outputs to business or organizational outcomes (such as leads, sales, donations, and/or survey scores). Some of this new quest for higher-level measurement results from the now-famous Barcelona Principles, which were established by the International Association for the Measurement and Evaluation of Communication (AMEC), PRSA, the Institute for Public Relations and two other industry associations at the 2010 AMEC European Summit in Barcelona, Spain. Utilizing much of the language and ideas found in PRSA’s The Business Case for Public Relations™, the seven Principles primarily mandate the importance of setting measurable goals and objectives, and moving toward linking outputs to outcomes. All that is great, but PR pros have been left wondering how to execute these mandates. They have plenty of guidance on objective-setting, but not as much on how best to measure outputs — and then, how best to link them to outcomes. Fortunately, the founders of the Barcelona Principles didn’t stop there. 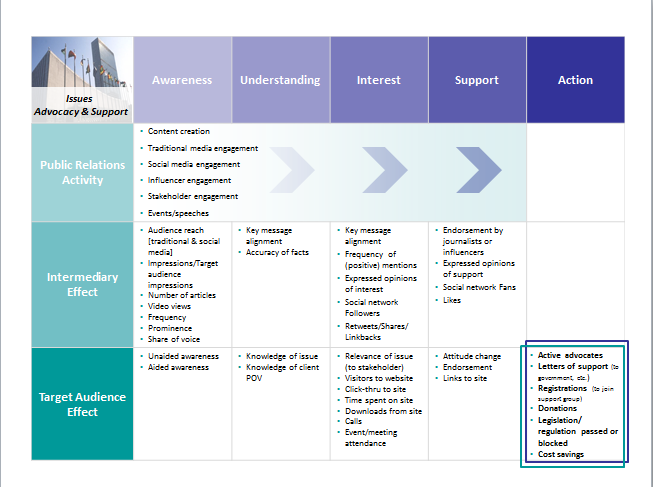 A special taskforce was deployed to develop what has become the AMEC Valid Metrics Guidelines, a set of practical frameworks that guide PR pros through developing a holistic, meaningful measurement process. I have found the Guidelines to be of enormous help to my clients, so I hope the following brief overview will be helpful to you. A message or story is created and told. It is disseminated by a third party (such as the media or influencers). It is consumed by the target audience (which ideally results in behavior change). PR Activity — metrics reflecting efforts to produce and disseminate a message. Intermediary Effect — metrics reflecting third-party dissemination of the message to target audiences. Target Audience Effect — metrics showing that the target audience has received the message and is considering acting on it. or has acted on it. Next, on the Horizontal Axis, you’ll see the five stages of the Communications Funnel: awareness, knowledge/understanding, interest/consideration, support/preference and action.The idea is to see measurement on a multi-dimensional continuum, leading from the campaign’s initial effort to its outcome by moving toward the bottom right-hand corner: the ultimate organization/business result. The Taskforce created eight different frameworks full of metrics for each type of campaign or PR effort, which focus on Brand/Product Marketing, Reputation Building, Issues Advocacy/Support, Employee Engagement, Investor Relations, Crisis/Issues Management and Not-for-Profit, Social/Community Engagement. 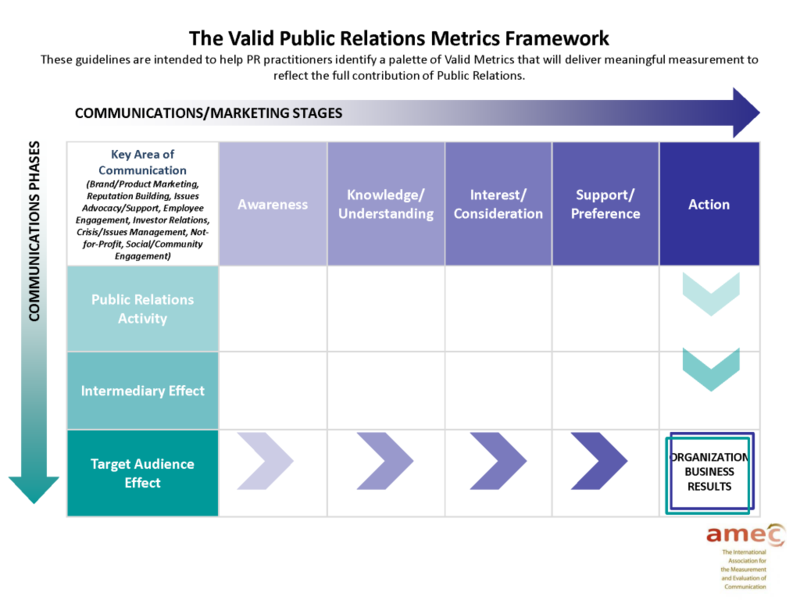 If you haven’t already set measurable objectives for your campaign, take a few minutes and read “Guidelines for Setting Measurable Public Relations Objectives: An Update” from the IPR Measurement Commission. A measurement program is meaningless unless it starts with objectives. Then, use a blank AMEC template and plot the metrics you use now. This will help you see where your focus has been, and where it needs to shift if objectives are to be met. Don’t be surprised if you learn most of your metrics focus on the simplest areas — outputs and awareness! In a new AMEC template, choose at least a few key metrics in all three of the vertical PR phases. Across the horizontal axis, choose metrics from the stage that is the focus of your campaign. For example, if your campaign is focused on “knowledge,” be sure to include measures that reflect “key message alignment.” However, also include metrics from the earlier stages, such as from “awareness,” so you’ll have the data you need to diagnose where things went well, and where they did not. In other words, say you don’t meet your goal regarding “knowledge.” It could be that your audience reached declined and have nothing to do with key messages. Once you’ve completed your AMEC template, look for the tools you’ll need for implementation. The template will force you to think beyond your comfort zone and perhaps find require your finding new vendors or tools! Finally, do not try to measure everything. Just pick a few key measures in the areas that matter most, but make sure they move as far as possible toward the bottom right hand corner. 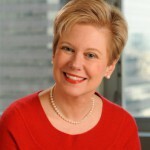 Angela Jeffrey is senior counsel to CARMA International, a leading global media analysis company, and president of MeasurementMatch.com, a high-level consultancy helping clients create PR and social media measurement strategies. She is also a member of the Institute for Public Relations Measurement Commission. Find her on Twitter @ajeffrey1 or at angie@measurementmatch.com.